So apparently chickens don’t like snow. Or at least our chickens don’t. We do have pretty spoiled chickens though, so that might have something to do with it. Our chickens refuse to walk on the snow. They’d rather hide out inside the coop, bored to the point of pulling each others feathers out, than go outside. We might have less than 6 chickens by the time spring rolls around. They’re pulling feathers out of the back of the two smallest chickens necks. Which isn’t good, but the real trouble will start if they keep going and someone ends up bleeding. Apparently chickens get blood lust. Once there’s blood, they’ll all go crazy killing each other. So to help, we’ve put a plastic ploy tarp over part of the run to keep the snow out. We’ve shoveled out all the snow currently in the run so they can go out. We’ve gotten a protein supplement for their food (I guess sometimes they peck because of a protein deficiency). And Jon got a no-peck cream to put on the two getting picked on’s necks. It also has tea tree oil to help the skin heal. He put it on the two and one tasted it to check it out, and immediately started shaking her head and rubbing her beak in the dirt – so it should be helpful! They are only laying maybe one or two eggs a day. And about 2/3 of the time the eggs are frozen when we get them, so our egg stash is pretty depleted. They’re barely producing enough to keep up with Jon’s breakfast routine. I haven’t had this much space in my fridge since they started laying! Jon’s much less enamored of them now too. They’re a lot more work in the winter than the summer, and we’re getting less from them. It’s also been freaking cold, and who wants to leave the warm house to go deal with chicken poop? We’ve joked that if we build our next house, we’re going to build a small barn with a built in chicken coop and run, so they can be inside and more protected (and therefore less work) in the winter. All of this definitely reinforces my refusal to have any other farm animals though. And makes me okay with our decision to wait until spring to get a puppy. No way would I want to house break the dog in the snow! 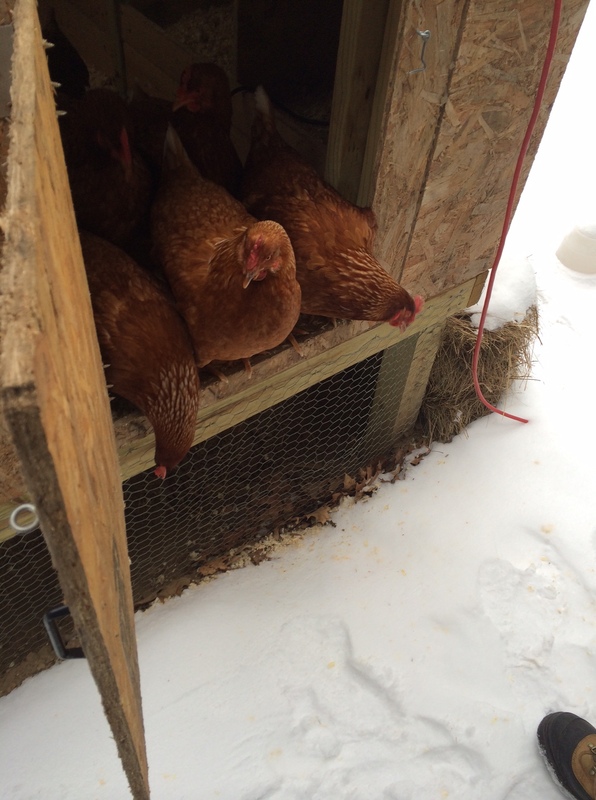 This entry was posted in Uncategorized and tagged chickens, snow, winter. Bookmark the permalink.